Peregrine falcons in southwestern Pennsylvania lay eggs from March through early April. By the last week of March some pairs have already begun to incubate while others are still courting and mating. Here’s the latest news from eleven sites near Pittsburgh where peregrine falcons have been confirmed or could be nesting. If you live near one of these sites, stop by and let me know what you see — or don’t see. We need news from the sites marked (**). Of all the peregrine sites in Pittsburgh, the Cathedral of Learning is the easiest one to watch because the nest is on camera. Hope laid five eggs March 11-21, 2019. Now she and her mate Terzo are incubating. In the March 25 Day In A Minute video above you can see their daily routine. Hope spends the night on the eggs, Terzo brings food (off camera) at dawn, Hope leaves, and Terzo takes over incubation. Then they switch off periodically. During the day Terzo spends a lot of time on the eggs. Can you tell the difference between Hope and Terzo? Here are some identification clues as you watch them on camera. Their eggs will hatch during the week of April 21-27, 2019 — but don’t get excited to watch them hatch. Every year Hope kills and eats some of her chicks while hatching. Very unusual and very abnormal!! I always advise folks not to watch. It is upsetting. This year Dori and Louie are nesting on Third Avenue opposite Point Park University’s Lawrence Hall because the Gulf Tower is unavailable. This means they aren’t on camera. 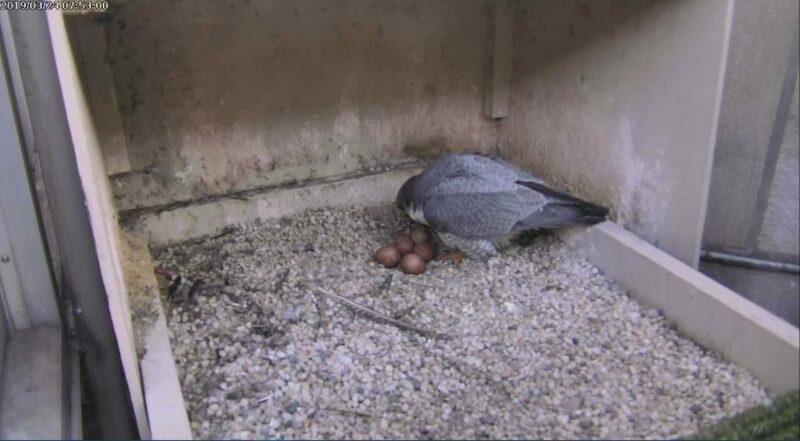 Lori Maggio confirmed that peregrine eggs were still in progress Downtown on March 21 because she saw the pair mating that day. Dana Nesiti visited the Westinghouse Bridge many times in early March and usually found the pair mating — as shown in his March 17 photo above. On March 24 John English and I visited the bridge and heard a peregrine calling. Soon the male arrived and went back and forth to the (hidden) nest area. Eventually he stayed inside and the female flew out and around the valley. Perhaps this pair is incubating now. Last year a pair of peregrines nested in a cubbyhole in the upper arc of the Elizabeth Bridge. Unfortunately, that location is very unsafe for fledglings and all of their offspring landed on the roadway and were hit by cars. This year while the bridge is still under renovation PennDOT blocked the cubbyholes. 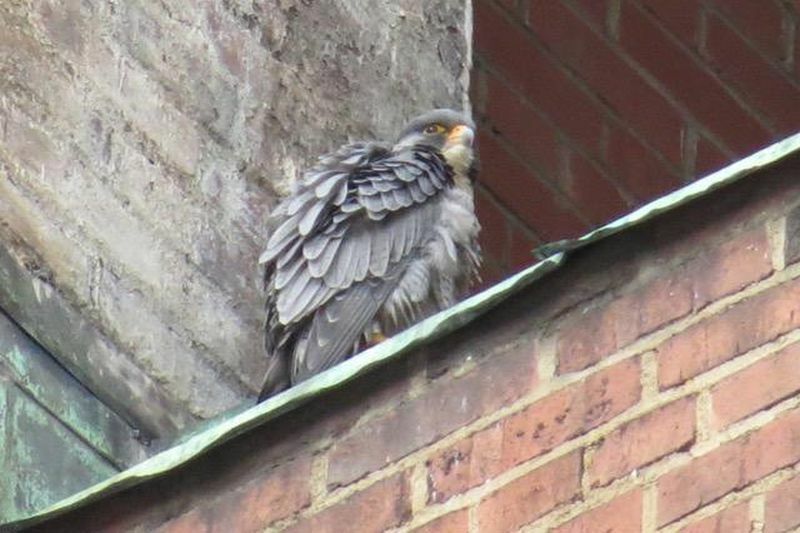 No peregrines have been seen for several weeks now, but we need additional confirmation that they aren’t nesting there. If you live nearby or use this bridge please look for peregrines and let me know what you see — or don’t see. Peregrines have nested at the McKees Rocks Bridge for many years but are always hard to monitor because the bridge is so large. John Flannigan captured a distant photo of the pair on March 4, 2019. More monitors are needed. Please contact me if you’re interested. 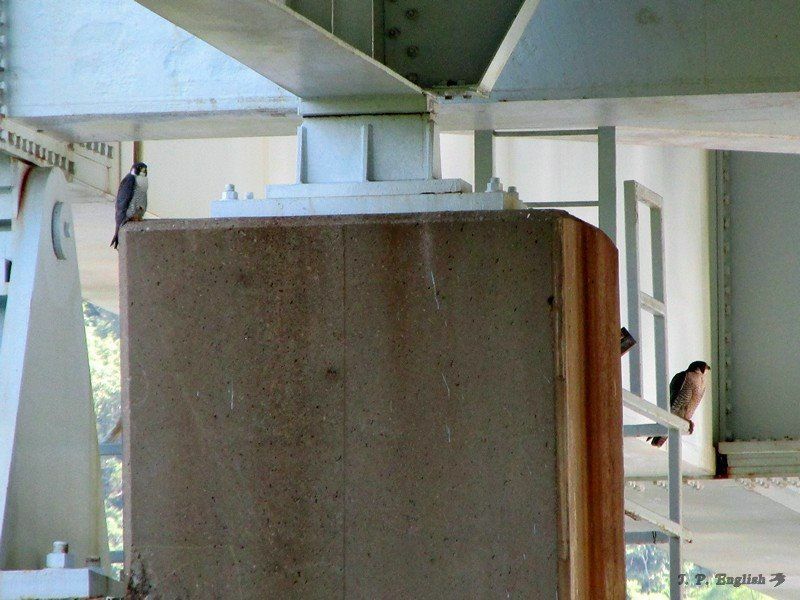 Peregrines have nested successfully at the Neville Island I-79 Bridge since at least 2012. This spring Anne Marie Bosnyak saw them mating at dusk on March 19 so we know eggs were in progress a week ago. This pair may be incubating now. NEW LOCATION! In late February and early March Mark Vass reported a peregrine — and then a pair — perched on the Ambridge-Aliquippa Bridge over the Ohio River. This bridge is a logical place halfway between two peregrine sites, Neville Island and Beaver, but its superstructure is “made of air” — open trusses with crossbars — so it’s hard to imagine where a nest could be. Last week Karen Lang began checking the bridge and has seen a peregrine every time she’s looked — March 20 and 25. 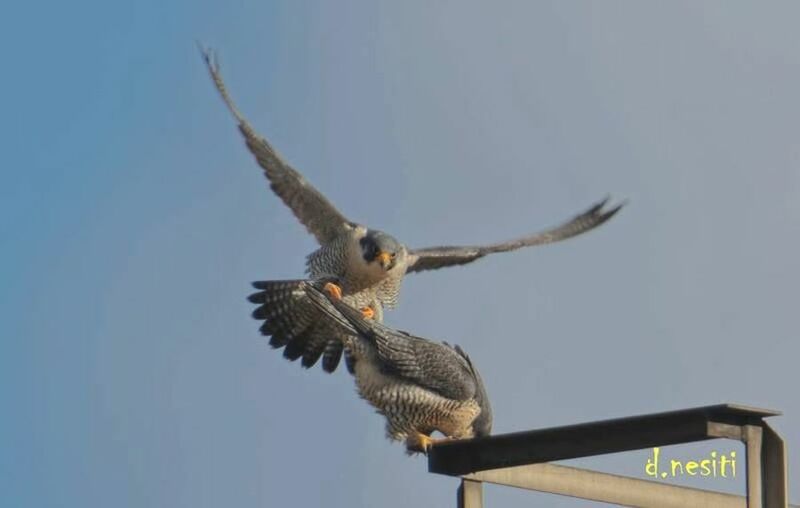 Peregrines have usually nested on a bridge in the Monaca – East Rochester – Beaver area but no one is monitoring them this year. Can any of you help? 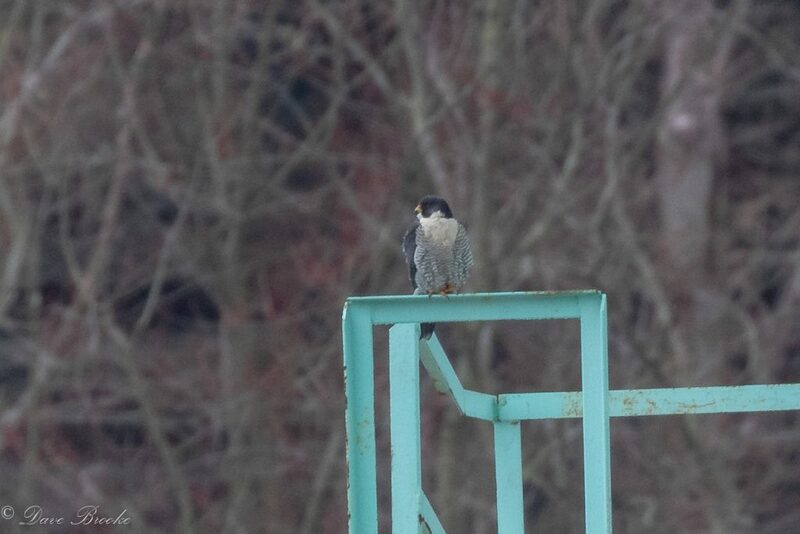 In January Gina Gilmore photographed a banded female peregrine hanging out near the Hulton Bridge on the Harmar side. Since then many observers have visited there because the Harmar bald eagles have laid eggs — but there’s no news of a peregrine. 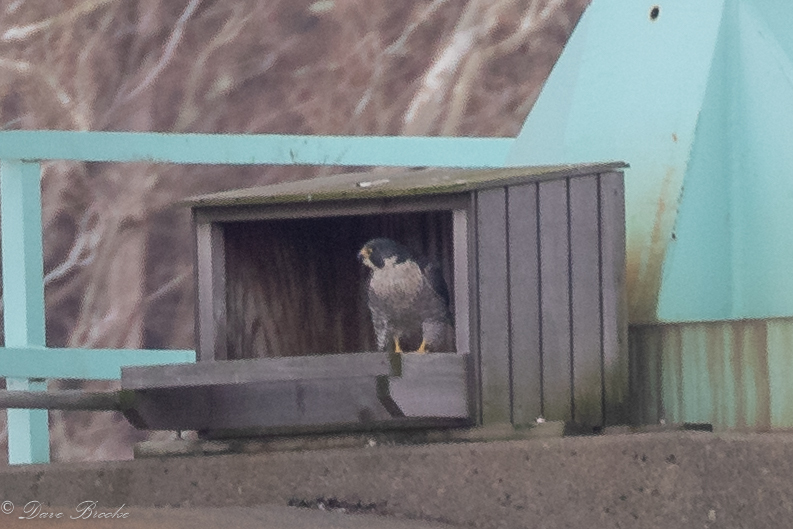 Has anyone seen a peregrine at Harmar lately? Please let me know. 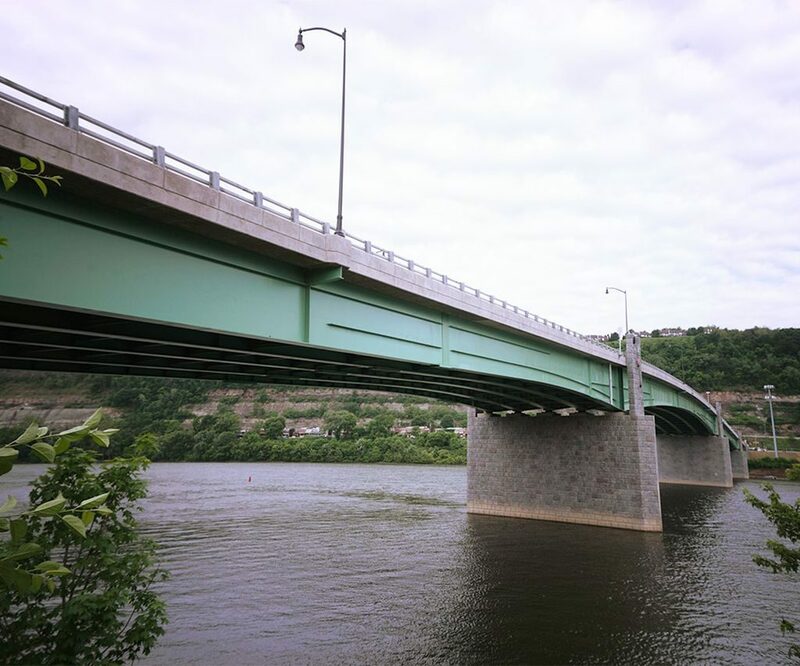 Peregrines have nested successfully on the Graff Bridge (Route 422) at Kittanning for at least four years but no one is currently monitoring the site. Please let me know if you’re interested. The picture of the Hulton bridge is old, the one in the picture was torn down 5 years ago or more. It has been replaced by a new bridge that I would say is not Peregrine friendly. If I were a Peregrine in the area, I would be nesting at the Bessemer railroad bridge a mile or two up river from the Hulton bridge. It is very high, very long, & has what a human thinks would be lots of potential for Peregrines. 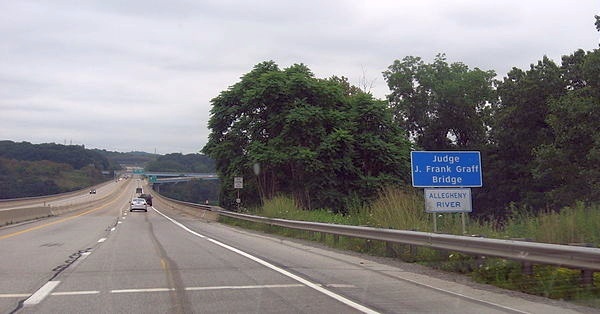 This is the bridge you see when you cross the Allegheny river on the Pa turnpike. Scott, Ah yes! Thank you for the reminder. Since I don’t live near there I don’t see it often & I forgot about the new bridge. Duh! LATER: I replaced the photo. I found a picture of the new bridge on the Gannett Flemming website. They were the Civil & Structural Engineering firm for PennDOT on this project. The new bridge has already won 3 awards. I hope to take a picture on my own. So many bridges, so little time. …and, the railroad bridge Scott mentioned is right next to an island where there’s a Great Blue Heron colony. Bird-friendly spot! Thanks Scott. I’m gonna go check it out if there’s a good viewing place. 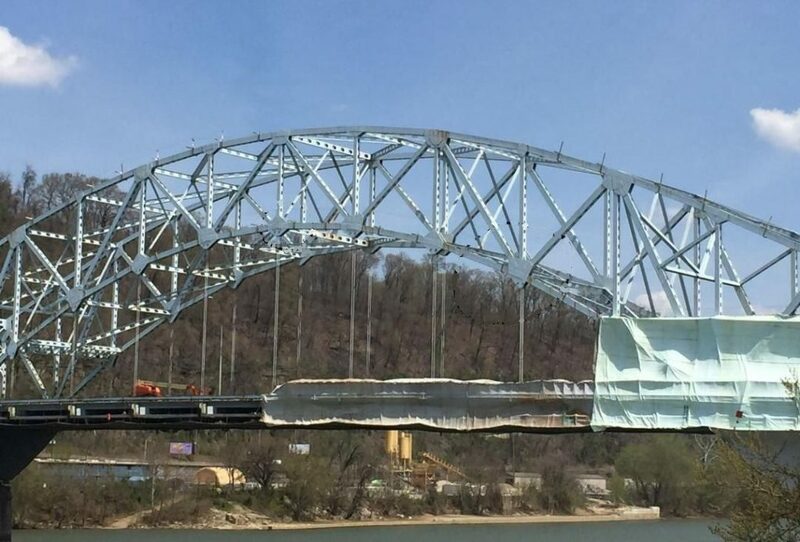 Sorry, I don’t have a picture of the new Hulton bridge. The old one was quite eye catching, decked out in lavender paint. Hi Kate, Across route 51 from the Ambridge bridge is a very sheer, vertical, rocky cliff. It’s way taller than the bridge. Any chance they are nesting up on that somewhere? To look at it , it makes more sense than the bridge. Thank you. Cindy P, that’s a good idea. It’s worth waiting at the bridge to watch where the peregrines go. On March 16, my husband and son were fishing under the McKees Rocks bridge. 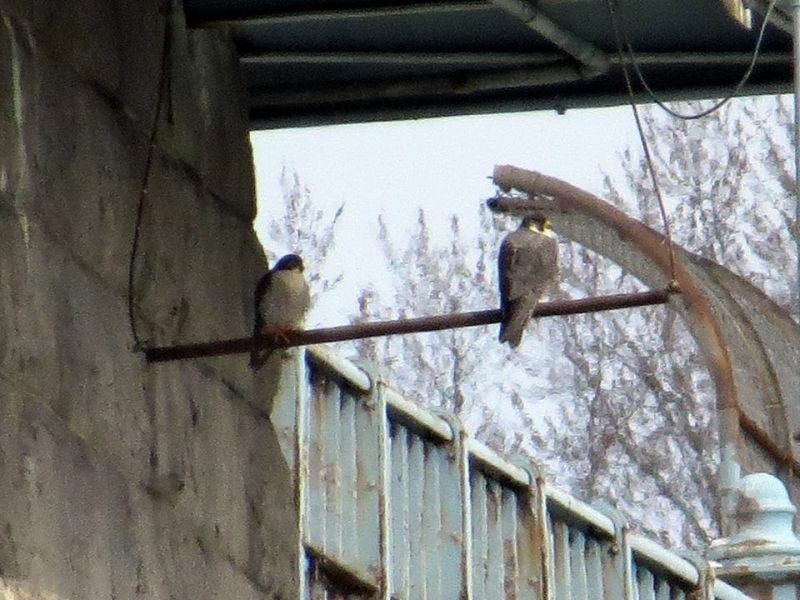 There was a great deal of peregrine activity on the McKees Rocks side of the bridge. They watched one (?) bird come and go repeatedly. They said it constantly went into the same space on the bridge. I would assume that means there is a nest in that location.